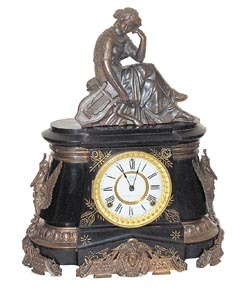 Ansonia Clock Co. enameled iron clock, "Pompeii", ca 1904. Comes with a statue which is almost perfect. This is another Ansonia from the Miller collection, clean original finish, and like the statue, almost perfect. 8 day, gong strike. Finished in Verde Bronze. Stands 11 inches high, 15 inches wide. Statue is 8 inches. French sash, beveled glass, 2 piece porcelain dial, all near perfect. Correct pendulum, and is running. Ly-Ansonia No.968.